Knee pain treatment may be provided in a number of forms. Knee pain treatment seems straight forward. The knee bends and straightens. Work on that, and we’re pretty much done, right? In reality, it isn’t that simple. The study of the knee and its movement is complicated as the movements of the hip and ankle play major roles as well. We believe the study of the entire kinetic chain from spine to foot helps us properly identify where the knee pain is coming from. We’ve found with patient after patient that we can then treat the pain properly in this manner and work to ensure that the pain doesn’t return. Knee pain can often come from the quadricep or quad muscles and affect the front of the knee or the patella area. For example, we believe that Active Release Technique, Graston, or dry needling can release this muscle quickly and effectively to reduce pain fast. Knee pain sometimes can come from a weak glute muscle as well, and we often need to strengthen the glute muscles in order to improve the quality of stability within the knee itself. We also often find that the key component comes from ankle flexibility. How is this? If the ankle is capable of being in what is called dorsiflexion – when the toes move at an angle of at least 20 degrees closer toward the shin (like the lifting off of the gas pedal motion, for example) then we can effectively move the knee without pain. If not, there’s a problem. For the reasons above, knee pain treatment must include a look at the ankle and the strengthening of the quadricep muscles. This is the most highly researched way to reduce knee pain. 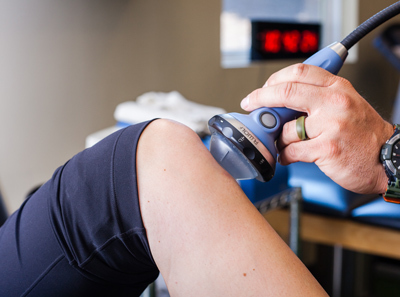 We believe the observation, study, and the treatment of the entire leg – from spine to foot – helps to reduce knee pain and reduce the likelihood of knee pain in the future. Research, as well as our experience with countless patients, supports this approach. How would you rate your knee pain on a scale of 1-10? Reach out and let us know – we’ll seek ways to relieve your pain and get you on the road to recovery.